This article is about a photographic device. For other uses, see Camera obscura (disambiguation). Camera obscura is Latin for "dark chamber." It is the name given to a simple device used to produce images that would lead to the invention of photography. The English word for today's photographic devices is merely a shortening of this name to "camera". At its most basic, the camera obscura is a simple box (which may be room-sized) with a small hole in one side, (see pinhole camera for details on how to build one). Light from only one part of a scene will pass through the hole and strike a specific part of the back wall. (The projection can be made on paper on which an artist can copy the image.) As the pinhole is made smaller, the image gets sharper, but the light-sensitivity decreases. With this simple apparatus, the image is always upside-down. By using mirrors, as in the 18th century overhead version, it is also possible to project a "right-side-up" image. The first mention and discovery of the principles behind the pinhole camera, a precursor to the camera obscura, belong to Mozi (470 BC to 390 BC), a Chinese philosopher and founder of Mohism. 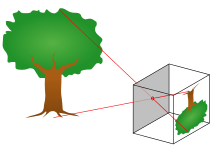 Later, Aristotle (384 to 322 BC) understood the optical principle of the pinhole camera. He viewed the crescent shape of a partially eclipsed sun projected on the ground through the holes in a sieve, and the gaps between leaves of a plane tree. The first camera obscura was later built by an Iraqi scientist named Abu Ali Al-Hasan Ibn al-Haytham, born in Basra (965-1039 AD), known in the West as Alhacen or Alhazen, who carried out practical experiments on optics in his Book of Optics. In his various experiments, Ibn Al-Haitham used the term “Al-Bayt al-Muthlim”(Arabic: البيت المظلم‎), translated in English as dark room. In the experiment he undertook, in order to establish that light travels in time and with speed, he says: “If the hole was covered with a curtain and the curtain was taken off, the light traveling from the hole to the opposite wall will consume time.” He reiterated the same experience when he established that light travels in straight lines. The most revealing experiment which indeed introduced the camera obscura was in his studies of the half-moon shape of the sun’s image during eclipses which he observed on the wall opposite a small hole made in the window shutters. In his famous essay "On the form of the Eclipse" (Maqalah-fi-Surat-al-Kosuf) (Arabic: مقالة في صورةالكسوف‎) he commented on his observation "The image of the sun at the time of the eclipse, unless it is total, demonstrates that when its light passes through a narrow, round hole and is cast on a plane opposite to the hole it takes on the form of a moon-sickle”. In his experiment of the sun light he extended his observation of the penetration of light through the pinhole to conclude that when the sun light reaches and penetrates the hole it makes a conic shape at the points meeting at the pinhole, forming later another conic shape reverse to the first one on the opposite wall in the dark room. This happens when sun light diverges from point “ﺍ” until it reaches an aperture “ﺏﺤ” and is projected through it onto a screen at the luminous spot “ﺩﻫ”. Since the distance between the aperture and the screen is insignificant in comparison to the distance between the aperture and the sun, the divergence of sunlight after going through the aperture should be insignificant. In other words, “ﺏﺤ” should be about equal to “ﺩﻫ”. However, it is observed to be much greater “ﻙﻁ” when the paths of the rays which form the extremities of “ﻙﻁ” are retraced in the reverse direction, it is found that they meet at a point outside the aperture and then diverge again toward the sun as illustrated in figure 1. This was indeed the first accurate description of the Camera Obscura phenomenon. In camera terms, the light converges into the room through the hole transmitting with it the object(s) facing it. The object will appear in full colour but upside down on the projecting screen/wall opposite the hole inside the dark room. The explanation is that light travels in a straight line and when some of the rays reflected from a bright subject pass through the small hole in thin material they do not scatter but cross and reform as an upside down image on a flat white surface held parallel to the hole. Ib Al-Haitham established that the smaller the hole is, the clearer the picture is. 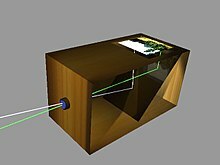 Although both the pinhole camera and camera obscura is credited to Ibn al-Haytham, the camera obscura was first described by Aristotle, who was the first to describe how an image is formed on the eye, using the camera obscura as an analogy. Alhazen states (in the Latin translation), and with respect to the camera obscura, "Et nos non inventimus ita", we did not invent this. North Carolina's "Cloud Chamber for the Trees and Sky"
There is also a portable example which Willett & Patteson tour around England and the world. ↑ Nicholas J. Wade, Stanley Finger (2001), "The eye as an optical instrument: from camera obscura to Helmholtz's perspective", Perception 30 (10), p. 1157–1177. ↑ "Construction of the First Camera Obscura : HistoryofInformation.com". www.historyofinformation.com. Hill, D.R. (1993), ‘Islamic and Jewish Science and Engineering’, Edinburgh University Press, page 70. Sinden Optical Company — Camera Obscura manufacturer. camera obscura - Research group at the University of Barcelona. www.estenopeica.es - Gabriel Lacomba: pinhole photography. kinor.net - Roland Buehlmann's abstract pinhole photography.